There has been a contradiction at the heart of recommendations for action on health inequalities. No one is more concerned with health than those of us in the health sector. But the key determinants of health inequalities lie outside the health care system. 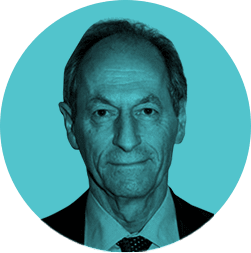 It is not so much what doctors do, or don’t do, for patients that cause health inequalities, but the conditions in which people are born, grow, live, work and age. This understanding informed our 2010 Marmot Review, in which we set out principles and recommendations to reduce health inequalities in England. We made recommendations, not for the NHS, but on early child development, education, employment, income support, housing, transport, environment and on the social determinants of healthy, and unhealthy behaviours. 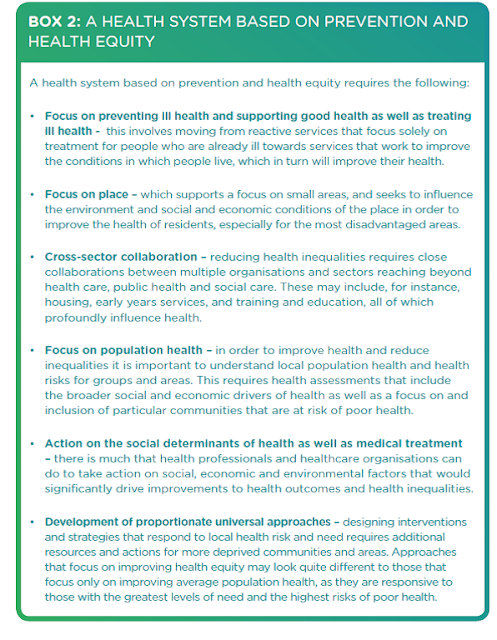 Since the Marmot Review, we have continued to build evidence, developing clear programmes for action on health inequality across all these sectors. We have also focussed on what health professionals can do. Omitted has been the potential role of NHS organisations in acting on social and economic drivers of ill health. Recognising that the NHS could do far more to support good health as well as treat ill health, I went to see Simon Stevens. We agreed that the NHS should be developing a stronger platform of activity in health equity and health improvement. The resource we have published today, 19th September 2018 ‘Reducing Health Inequalities through New Models of Care’ is the outcome of these discussions. In the report we make the case for the NHS to take more action on social determinants of health and, drawing on discussions with several vanguards and NHSE staff, we assess exactly what these actions might be. 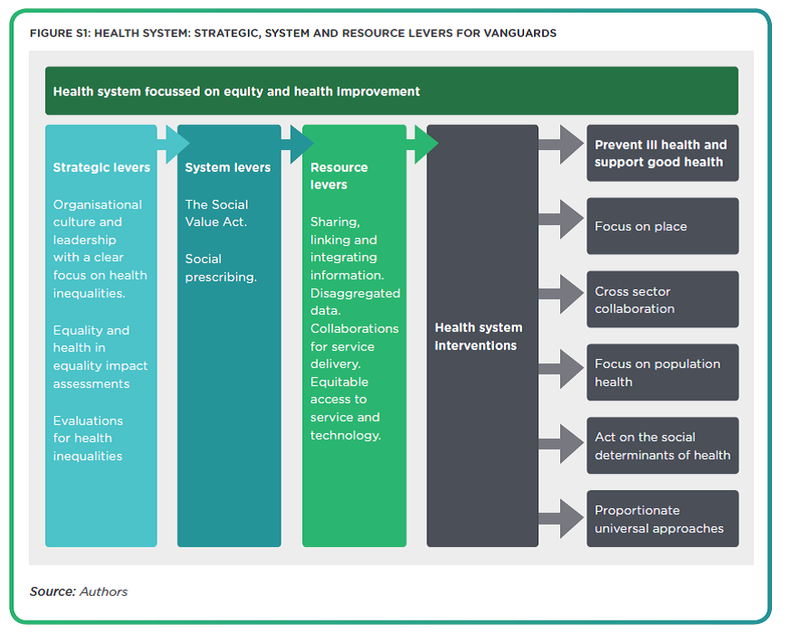 We develop principles for a health system which is based on prevention and health equity. We developed a diagram to show how vanguards can use existing strategic, system and resource levers, which are available to them, to develop a strong focus on health inequalities – working towards developing and embedding a local health system focused on prevention and health equity. Our approach is based on discussions with several local vanguards – all of whom are trying to use mechanisms at their disposal to reduce health inequalities. They provided plenty of good examples of local actions which several NHS organisations are taking in collaboration with other sectors to implement programmes and activities to drive reductions in health inequalities; and they demonstrate a real appetite to do more. They suggest that a better understanding of population health needs, and sharing information on social determinants underpins development of a healthy and equitable health system. To this end we worked with Tower Hamlets Vanguard to establish an integrated local data system – a whole systems dataset (follow link to the dataset) - which combines social determinants, health outcomes and health care utilisation data at small area level. The next stage is to analyse and use the data to drive strategies and service development to tackle poor social determinants at local level. We also discussed the importance of legislative requirements and in particular the benefits of equality and health inequality assessments, appropriate equity focused evaluations, use of the social value act in commissioning and social prescribing as ways of driving forward action on social determinants and health equity. Vanguards also highlighted inherent risks to equity – expanded use of technology and inconsistencies in care home service provision for instance. Our report describes all these elements, and urges the development of an ambitious local health system – which focusses on population health needs and good health for all as well as provision of treatment and services. We must learn from the efforts of these vanguards and strengthen and embed them right across England. As the Five Year Forward View pointed out, rising demand and costs have put the NHS and workforce under immense strain – improving health and reducing inequalities is more important than ever. And, of course, improving health equity is central to the mission and work of the NHS and all those working in it.